An OSBA-endorsed program, EasyProcure is a Visa procurement card solution issued through PNC Bank, National Association. The cards are accepted by all merchant and vendor locations where Visa is accepted. P-Cards enable your district to benefit from the combined spending of all participants in the program. Beginning with your first dollar of spend volume, your school district is eligible to receive a portion of the revenue generated by the total amount spent by all Ohio districts in the program. So that means the more districts that participate, the greater the revenue sharing. View the video, “Benefits of Using a P-Card,” for a more detailed explanation. In 2016-2017, Ohio school districts in the program spent more than $30 million and received more than $400,000 in revenue sharing. Currently, approximately 65 Ohio school districts participate in the program. For more information about the EasyProcure program or to apply, contact Patricia Jackson of PNC at (614) 463-8065 or view the EasyProcure FAQs. You can also email OhioEasyProcure@pnc.com for additional information. Lending products and services, including card services and merchant services, require credit approval. 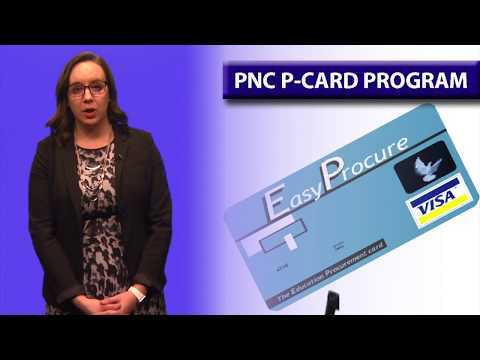 PNC Bank's Laura DeFillippo shares the many benefits of the P-Card program.